You know what the real problem is with the sport of golf? Aside from putting, because getting that little dimpled ball in the vicinity of the hole is fun, actually getting it into a hole the size of a super big gulp lid is seriously frustrating. So, aside from putting -- and defense...it would be such a good game if the other guy could have a small hockey goalie shaped putter for defense...aside from putting and defense -- the stock golf carts are way too slow. Ever try to run an electric golf cart through a sand trap -- instantly stuck. And forget about evading the police, a fat mall cop on a Segway will give you a run in a stock electric cart -- but not today, because some genius has just fixed golf. 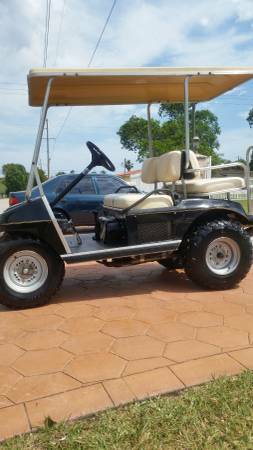 Find this 2006 Golf Cart with 500cc Polaris power offered for $5,000 (or a llama) located in Miami, FL via craigslist. 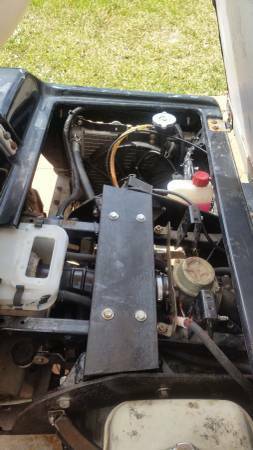 This thing might have started life as a simple putt-putt electric golf cart, but it is now powered by a 500cc engine from a Polaris ATV (probably a Sportsman Quad) good for something in the 25 horsepower range. There are a number of communities (especially in FL) where golf carts can be driven on public roads legally. Not a bad way to get around when it is nice outside. The ice cream truck in my small town is a golf cart towing a small trailer. It is the perfect application really. Ice cream doesn't sell when the weather isn't good anyway. 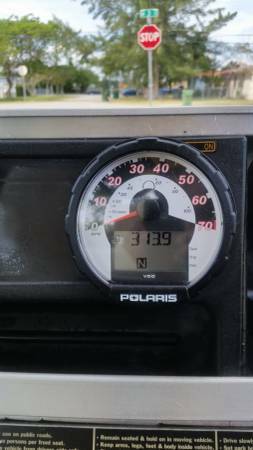 Personally, I have long been promoting the concept of Speed Golf. In this version, it is not how many strokes, but rather how fast you get the ball in the hole. I envisage grouped tee shots, then guys running towards their NASCAR V-8 powered golf carts. Race across the fairway to your ball, whack it again, and jump back onto the cart. Carts would not be allowed on the greens (gotta be reasonable here), so foot races would occur for those final shots. Now that would be a spectacle! Glad to see I'm not the only one who thinks that way. Golf would be a lot more fun to watch if they just changed the rule from "lowest score wins" to "lowest elapsed time wins." 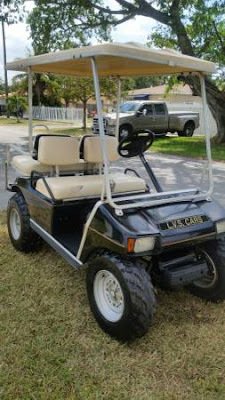 Mickey Mantle was reported to have said "The one with the fastest golf cart never has a bad lie."